Do you love to play Bejeweled, but long for a more challenging, free app for your android device? Well here it is. 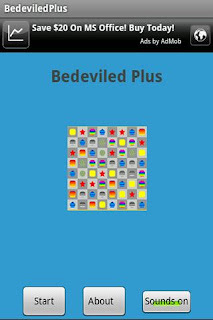 Bedeviled Plus by monjod is a free app for Android that is very similar to Bejeweled in that the goal is to get 3 of the same object in a row to clear the screen. Two objects adjacent to each other can be moved if it will result in 3 in a row, and to slide from object to object you have to press down on one object while raising on the other. The great thing about Bedeviled Plus is that it is an entertaining way to pass the time that will keep your mind sharp. Though it is winnable, the challenge is always there. The more we work the brain the stronger it gets, the same as our body's muscles. When you're waiting in line, in a waiting room, or anywhere else you typically feel like you are wasting time, you can play Bedeviled Plus and strengthen your mind while being entertained. 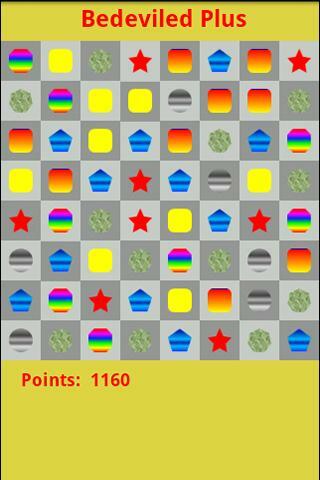 The thought processes and logic required to plan a move increase logic and reasoning skills. These skills can help you in your everyday life, meaning that playing Bedeviled Plus really is a smart move. With outstanding, colorful graphics and the global high score system supported by Swarm software, there really is nothing better out there for having fun. Forget those games that turn your mind to mush and drain your pocketbook. Bedeviled Plus is fun, free, and good for your brain. What else could you ask for?